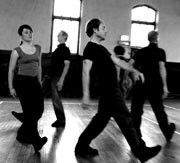 Goat Island are one of the world’s leading contemporary performance ensembles. They make intimate, intensely physical performance that represents a distinctive hybrid of live art, theatre and postmodern dance. In Goat Island’s ninth (and final) piece, the audience are seated on opposite sides of a square stage. They are taken on an historical and architectural journey, focussing on the singularity of buildings that have followed the trajectory from church to mosque to museum.